Will Resume Toggin, But Inshore & WHEN? After reassurances from top fishery managers, I'm opening the sea bass reservation book with Tuesday, May 15 as 'opening day.' I'll accept sea bass reservations thru Sunday, June 3. Reservation staff will begin taking these 'no refund' reservations at 9AM on Thursday March 22, 2018..
Make Reservations at 410 520 2076.. These folks have been doing my booking for 14 years. They're on it! So that everyone always has room, sea bass trips are limited to 25 people with well-defined spots as shown on my website..
We ALWAYS try to leave a half-hour early (and rarely get in on time..) Be early. Tog fishing WILL resume, but sheesh.. Everytime it snows inland, ocean waters cool further. Sun's trying to warm the ocean as days lengthen; not making progress though owing snow after snow after snow.. I'll post when we've got a bite going on inshore. The big one this year, just had a "COI" inspection (Certificate of Inspection) given every 5 years. We passed in fine style. It's a good thing -- makes you truly look at every aspect of your boat. EVERYTHING has to work.. There will be 4 years of annual safety re-inspections, plus a separate hull inspection required at haul-out every 18 months, before my next COI..
Have also been pulling heavy engine maintenance -- almost there. Need to do some reef monitoring work. Can do that regardless temperature owing the abilities of Nick Caloyianis &, now too, GoPro cameras. Want to especially go look at several block piles we've built over the years, and also some of the large Iron Lady concrete deployments from a couple years ago. Want to see what's going on with growth such as star coral (too soon on recent constructions most likely) and sea whip, a soft coral. I thought we'd have crossed the 20,000 block mark by now. Still at 19,587.. Every trip we take 12 or more heavy cement blocks. It adds up. Sometimes (& likely soon!) we'll take 6.5 tons or so of blocks--hundreds. By double anchoring and dropping all the blocks from on place on the rail we can build a tight set. Plenty say Can't -- Always Lots Of Can't -- "you cannot build reef from a small boat." I've had my best day of summer fishing on one of the block piles that we'd built. Given time, these piles of hand-thrown concrete will grow over with coral. Meanwhile, the mini-ecosystem that grows on its own wherever a hard substrate is available will provide food and spawning habitat for tog, sea bass, & flounder among others.. Imagine: Despite the best bottom paint money can buy, if you leave a boat overboard long enough, it's hull will become loaded with all manner of growth ..none of which are easy to scrap off. In that growth are small hiding places & food: the marine food web is begun. A reef project I've long dreamed of, we should soon have 5,000 tons of boulder on the bottom about 8 miles offshore where there was once natural reef. No one's going to scrape that growth.. I see REEF for thousands of years providing no super-hurricane moves a sandbar atop it. I absolutely believe reef building far more important now to fisheries restorations than further regulation. NOAA, so far as I can tell, hasn't yet troubled themselves with marine habitat in the Mid-Atlantic. There's no urgency to discover what remains of our natural reef ecology, and certainly no concern whether restoring lost reef (that they have no idea was lost!) would bolster fish populations simply by providing new places for fish to feed & spawn - to hide from predators as well ..except us. But that's why we have regulation. Honestly, many in top positions today were taught in school: "Artificial reef concentrates fish for easier recreational harvest." Hmmm.. If we were to fund 10 new reefs this year, that would decrease fishing pressure on existing reefs, Right? Soooo.. How does that concentrate fish? How does increasing the amount of reef habitat concentrate fish? Wouldn't we have to instead REMOVE habitat that fish might be concentrated on fewer places? Did exactly that (remove habitat, destroy it) beginning in the 1950s, then all through the 1960s & into the early 1980s with stern-towed fishing gears. Whenever/wherever there was an increase in "time on bottom" with heavy dredges/trawls -- habitat suffered. For the most part: habitat that could be damaged--even completely lost--owing dredge/trawl, was destroyed by 1980. Turns out the "concentrate fish" aspect of reef building concerns a few species of grouper who aggregate from far & wide to spawn. Perhaps here is one of the rare occasions when a 'spawning closure' would make sense. I generally hold ALL fish are spawners - that any fishery removal is removing a spawner. I've witnessed tog & sea bass populations skyrocket despite heavy fishing pressure during their spawning season. In fact, I absolutely believe sea bass can be made MORE PRODUCTIVE with fishing pressure than without..
Habitat just hasn't been thought out. Makes me crazy to see such fantastic benefit at sea escape NOAA's notice. So far as 'science' can tell, there's no benefit at all from marine reef building on a computer screen. Perhaps one day soon the evidence will be overwhelming. Meanwhile -- an argument against reef building can be countered thusly: "So, we have too much coral?" Yeah, it's pretty simple. Roll some boulders off a barge this spring--I hope!--All the life that grows there for the next couple thousand years will have been directly related to a volunteer/donation driven .org..
As importantly, maybe more so if you like billfishing, is building oyster reefs in the Chesapeake. The work of oyster restoration, long thought "Impossible," has been nearly perfected. While OCRF does not build oyster reefs, we grow coral; it's important owing each estuarine oyster's ability to filter nearly 50 gallons of water a day. Oysters are vitally important to restoring clean blue waters to our coast. We'll help when able. Yes, habitat restoration can restore fish populations by increasing spawning production. In the case of oysters, even turn the ocean blue - deliciously. After a year of modest reef building, the Ocean City Reef Foundation now has a lot going on. This year's Reef Dinner will be held at Seacrets again. We're assured by Seacret's banquet staff we'll be allowed children for the May 6th event - 4 to 8.. We're booked. IF YOU HAVE AN ITEM TO DONATE FOR DINNER AUCTION/RAFFLES PLEASE EMAIL!! We've a new major corporate sponsor -US Wind- it's huge. US Wind has offered to pay for the deployment of 5,000 tons of boulder at the Bass Grounds Reef Restoration project. Loading Barges, Towing, Deployment in grand scale; their sponsorship will bring the Bass Grounds Reef Restoration project to life. US Wind has also indicated a long term relationship.. We could sure use the help. For our part, OCRF has over $100,000.00 in funds. I believe that's more than we've ever had on hand at one time. Plus we have a previous grant from The Nature Conservancy for $50,000.00 to spend on boulder! It's going to be a sweet reef. One that will last far into the future. The more boulder we can buy, the more bottom we can build. It's all about the donations. 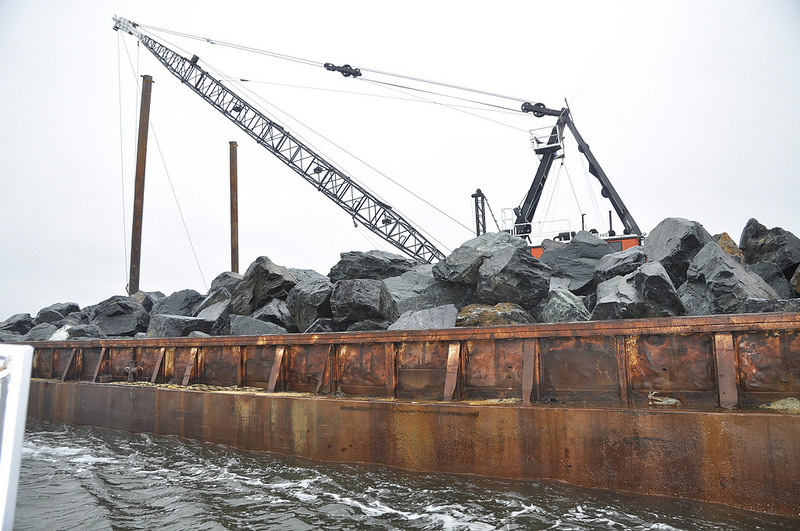 ​Pic is 1,000 tons of boulder from the Love Point Reef Project with the Maryland Artificial Reef Initiative (MARI.) Erik Zlokovitz. We're looking at deploying 5X this much..
Closer & closer, we have an amazing donation in the works with Fascan in Baltimore, put together by Rusty at Crane Specialists.. Too soon to spill the beans, (but any moment now!) this enormous donation will make local reefing efforts a heck of a lot more simple..
New 2018 charts show our few constructions of last year highlighted in yellow. However, of great interest to chart users & an accurization project that's almost finished; for this year's edition I combed through the Great Eastern Reef's bearings and made numerous corrections. I also overhauled the African Queen Reef's bearings with a sidescan survey. All new chart corrections are highlighted in yellow. (an aside, see http://articles.baltimoresun.com/2002-07-06/features/0207060081_1_danielsen-african-queen-delaware-bay for how the Queen Reef Site came by its name. Fascinating story.) . Sponsors: be aware donations really are the only thing driving construction. Ours is not a state program. If you make a copy of the charts for a "buddy," (who doesn't share your vision!) you're lessening future construction..
We got where we are through donations. There's a lot further to go. Picture someone saying, "There's too much coral off Ocean City." ​Here a boulder reef made by barge-spill off Maryland's coast. The pic was taken by Rick Younger at 1AM while on the Morning Star. Life is different on our reefs after the sun sets. The Bass Grounds Reef Restoration Project is about making this sort of reef in sq miles, rather than sq yards..
Have a new shirt design this year. Simple--one color; it's one of Niki Pino's artwork contributions modified by Mike at Red Sun for sweats/Ts..
Bill Regan, owner of Red Sun, will be printing them shortly. And, like last year, he is donating 150 shirts on top of our order! Look for new shirts in donations of over $100.00 after 3/25/18..
We're also now officially registered with Federal/State Surplus. Will be looking for who knows what, but especially sinkables or any means to transport them.